Finding the essence at the core of a marketing strategy or, for that matter, of a company, makes all the smaller decisions much simpler. When you know where you’re going you can easily decide if certain steps take you closer or further away from that goal. Does this media spend bring us into their consideration set? Will that promotion benefit those customers we really care about? Are three more days of debugging worth delaying the launch? These questions will always pop-up, but the team that can act quickly and efficiently will have the knowledge and understanding of what’s at the core. 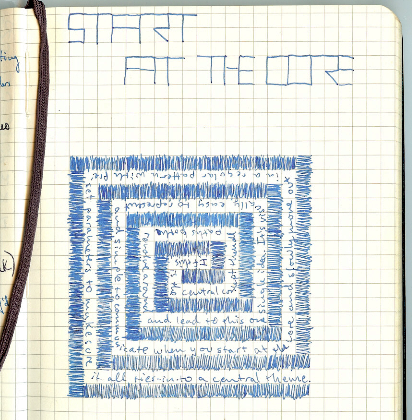 That’s the best place to start, at the core. Have you ever tried to write in spiral starting from the outside tip rather than the core? Have you ever launched a promotion quickly rather than truly understand the marketing need? 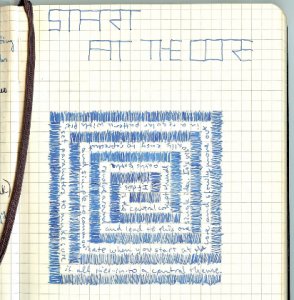 Without deciding on a center and drawing the guidelines to write out in a spiral, things get complicated very quick. Without a central theme your marketing effect is diluted. You spend more time correcting and possibly end up in the wrong place. If there is a central concept, then all paths can both revolve around and lead to this one single idea. It’s easy to represent and simple to communicate when you start at the core and slowly move out in a pattern with known parameters to make sure it all ties into a central theme.